One of the best ways for companies to improve their customer interactions is to integrate the contact center and their customer relationship management (CRM) system. Connecting contact center capabilities to the CRM software makes it easier to give agents a 360-degree view of the customer and makes it much more likely that the customer’s experience will be seamless. 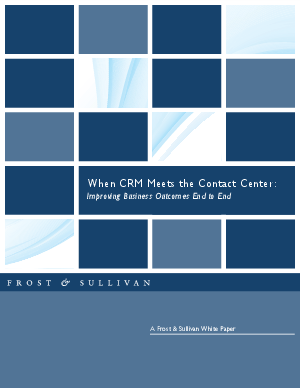 Are you ready to integrate your CRM with your Contact Center tools? Read this Analyst Paper to help you provide a personalized experience for every customer.